THIS CITY IS CALLED PETROPAVLOVSK-KAMCHATSKY LOCATED ON THE BERING SEA AT THE BASE OF AVACHINSKY VOLCANO. THE PORT IS A LIVELY AND MYSTERIOUS PLACE CLOSELY GUARDED BY THE SALMON EATING WILD BEARS WHO LIVE IN DERELICT SHIPPING CONTAINERS ON THE DOCKS. And yet, as the eye scans Carter’s work, none of this information is overtly present, except for the water at the bottom and the small brown shapes that might represent the bears. 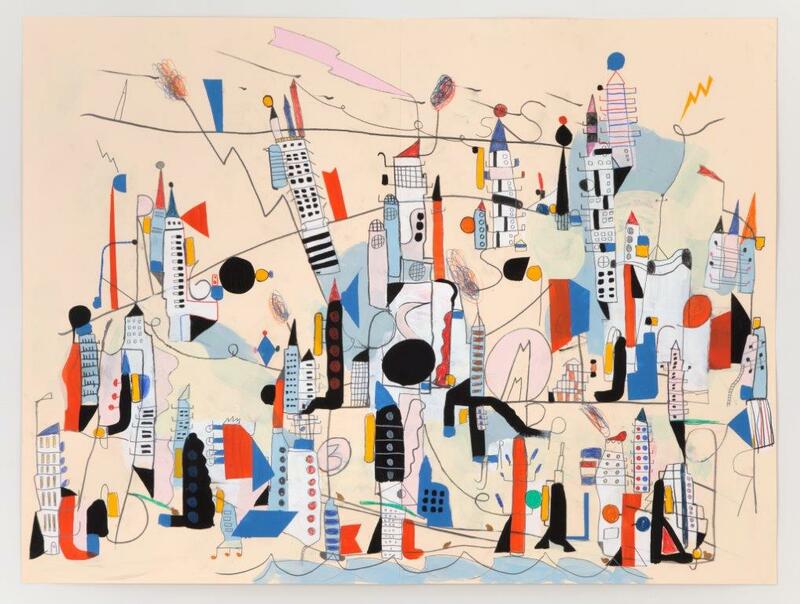 Typical of Carter’s work, the image here contains a playful, yet rigorous, system of shapes, lines, and colors possessing a childlike, chaotic quality that ultimately form a tightly-composed work. These elements offer us a lively impression, or even a memory, of the town, rather than a representation, especially when considered against Carter’s descriptive title. Nathan Carter recently participated in the Kemper Museum of Contemporary Art’s exhibition The Map as Art, and other museum exhibitions include THE FLYING BRIXTON BANGARANG AND RADIO VIBRATION VEX-VENTURE, MURA at Museo de Arte Raul Anguiano, Guadalajara; THE COVERT CAVIAR FREQUENCY DISRUPTOR at ArtPace, San Antonio; and YO PIERRE at Domus Artium, Salamanca. Carter has also participated in a number of group exhibitions, including Alexander Calder and Contemporary Art: Form, Balance, Joy originating at the Museum of Contemporary Art, Chicago; Sculpture as Time: Major Works, New Acquistions, Art Gallery of Ontario; and Drawing in Progress, Middlebrough Institute of Modern Art.